Not to be confused with Minor league ice hockey. "Youth ice hockey" redirects here. It is not to be confused with junior ice hockey. Initiation (Mini Mite, Tyke or H1/H2, Pre-MAHG, MAHG 1 and 2): under 7 years of age In some larger areas with multiple associations in close proximity, Tyke is broken up by age into Hockey 1 (H1) for 5-year-old players and Hockey 2 (H2) for 6 years old players. In the Province of Quebec, players start in Pre-MAHG to initiate skating technics. Over the next two following years they are in levels MAHG 1 and MAHG 2 to develop a sense of the game. Novice (Mite or H3/H4 or MAHG 3 and 4): under 9 years of age In some larger areas, Novice is broken up by age into Hockey 3 (H3) for 7-year-old players and Hockey 4 (H4) for 8-year-old players. Juvenile under 20 years of age, for players who want to remain in hockey at a minor hockey association level. Those not playing Junior or playing Senior. Junior: under 21 years of age Junior: divided into Major Junior (WHL, OHL and QMJHL), Junior A (Tier II Junior), Junior B and Junior C (in some locations). There are two broad grouping of skill levels: competitive and non-competitive. From house league/recreation hockey, progression is made to competitive travel hockey. A competitive team will hold tryouts and players will be selected for the roster depending upon skill level and fit. At this level, players chosen to compete experience a higher level of on-ice competition and coaching. Players learn systems; coaches maximize his/her potential and train them to work together as a unit. HL ("House League" or Recreational) teams are intra-city and players may be of any skill level. Rostered Select teams will consist of better House League players who in addition to HL play, will play in additional games and practices which are organized on an ad-hoc basis. League Select teams will consist of better House League Players but can also play in a league for a full season in addition to the House League Season. This is also known as Select in some area. Higher-skilled players will typically play on "representative" or "travel" teams that will travel to play representative (rep) teams from other areas. These teams are classified by skill. Not all cities will have teams at all skill levels, depending on size and the popularity of hockey, however even small communities may field teams at multiple levels. (For example: Orillia, Ontario, with a population of 30,000, has four distinct skill divisions for 7-year-olds.) The classifications are typically not certified by any external organization, so there is speculation about what levels are truly better or stronger than others. AAA, AA, and A hockey are nationally recognized as competitive levels of organized hockey, with AAA being elite competition. 'C' Playing other associations in a region. "A" level teams are designated by the following tiers: Tier 1, Tier 2, Tier 3 and Tier 4. For the purposes of affiliation regulations, each Tier designation will be considered a category. 1.04 All Winter Clubs are designated Tier 1. This designation is to be reviewed annually by the BC Hockey Executive Committee following consultation with the District Association. 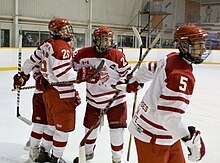 In a 2001 study published by the University of Toronto Press, the effects of minor hockey players who are born in the first half of the year (January–June) were directly compared to those who are born in the second half of the calendar year (July–December). The study aimed to determine how age affects a young player's probability of playing at a higher level in the future. Given the relatively short age brackets in Canadian minor hockey (players move up one league every two years before the age of 15), it was hypothesized that players who are born in the latter part of a calendar year are at a disadvantage (theoretically, a child could be playing with peers who are 2.5 years older than themselves under the current Canadian Minor Hockey system). The findings in this research were consistent with the hypothesis; upon extensive testing throughout several leagues and age divisions in Canada, Hurley, Lior and Tracze concluded that age plays a significant factor in a players ability to excel in hockey beyond the house league level. The findings of this study resulted in the proposal for redistribution of player slotting in minor hockey under a new "quarter" system. The system proposed would split a year into four-quarters, consisting of three months each, for example,1992(3) for players born in 1992 sometime in the third quarter (i.e., sometime in the months July, August or September). Under this proposed system players would play against players of a similar age, never playing opponents who are over 24 months older than them as the current system allows. The proposed system would operate under an 8-year basis, moving players from division to division each year. All levels are administrated by the respective sub-federation in each province except for the federal leagues which are administrated directly by the German Ice Hockey Federation. Ages were raised in 2010/2011. Some levels (especially J18 and J20) are directly administrated by the Swedish Ice Hockey Federation, while lower divisions of the Juniors and below are administrated by the respective sub-federation in each landskap. The Swiss Ice Hockey Federation designates the following levels : using terms from the national languages of Switzerland. Piccolo (ages 11 and under), Italian for "little"
Girls hockey operates under their own age classifications, namely 10U, 12U, 14U, 16U and 19U. Many organizations and leagues that have larger numbers of registered players tend to delineate within the two-year window allowed for each age group. In these situations, teams composed entirely or primarily of players in their second year of eligibility are designated 'major' teams, while those with players in their 1st year of eligibility are designated "minor" teams. (For example, ten-year-olds would be "squirt majors" while nine-year-olds would be "squirt minors".) This is especially true in "AAA". Some leagues separate players six years old and younger into their own group, often referred to using names like "Mini-Mites", "Mosquitoes", or "Microns." Tier 1: The highest level of competition, also called "AAA", following the Canadian system. Tier 2: also called "AA" or "A". Tier 3: may also be called "A", the lowest level of competitive hockey. Recreational/Developmental: Includes house league and select. May also be called "B", "C", etc. The Amateur Athletic Union has returned to licensing the sport of ice hockey. During the 2011–2012 season the AAU began licensing junior and youth leagues as well. The Western States Hockey League (WSHL) moved their operations from USA Hockey into AAU and Hockey Michigan was formed, providing Mite (8-and-under) conventional full-ice playing opportunities in the face of cross-ice mandates adopted by the USA Hockey district affiliate. During the 2012–2013 season, AAU junior and youth operations expanded rapidly and currently span coast to coast. Although some AAU clubs still use classification terms such as "mites" or "midgets", the official AAU youth designations indicate the age group with the format "xU", where "x" is the maximum age number and the "U" indicates "and under". A youth hockey official signalling an icing call. Officials for youth hockey are often youth players themselves, calling games in lower levels than the one they participate in themselves. Just as players start out playing youth hockey, officials start their officiating career officiating youth hockey, making it up through the ranks as their officiating skill increases. USA Hockey defines certain levels of their officials and so does Hockey Canada and the International Ice Hockey Federation. Currently, many youth officials quit after a few games, mainly due to verbal abuse from parents, coaches and players. The other issue faced by young referees is a reluctance from older officials to give them more advanced games. In the US and Canada, news stories pop up from now and then that describes physical abuse on youth officials, in addition to verbal abuse. These problems were addressed in Hockey Canada's "Relax, it's just a game"-campaign, which started in 2002. A youth official can usually move up the ladder to juniors after about 2 years of officiating, and after a few years move up to senior hockey. This is of course, just as with players, different for each individual as their skill-curves are differently shaped. Many current and former officials feel that their officiating career has aided them in their professional life as well, being more comfortable with handling critical decisions and upset individuals. ^ "Skills Development: Initiation – Player Development Essentials". Hockey Canada. Retrieved 4 June 2015. ^ "Skills Development: Novice – Player Development Essentials". Hockey Canada. Retrieved 4 June 2015. ^ "Skills Development: Atom – Player Development Essentials". Hockey Canada. Retrieved 4 June 2015. ^ "Skills Development: Peewee – Player Development Essentials". Hockey Canada. Retrieved 4 June 2015. ^ "Skills Development: Bantam – Player Development Essentials". Hockey Canada. Retrieved 4 June 2015. ^ "Skills Development: Midget – Player Development Essentials". Hockey Canada. Retrieved 4 June 2015. ^ "Canadian Development Model: Parent Information Handbook". Hockey Canada. Retrieved 31 January 2013. ^ a b Hurley, William; Lior, Dan; Tracze, Steven (2001). "A Proposal to Reduce the Age Discrimination in Canadian Minor Hockey". Canadian Public Policy. 27 (1): 65–75. doi:10.2307/3552374. JSTOR 3552374. ^ "Youth & Girls Hockey". USAHockey. Retrieved 4 June 2015.